For two to four players, Garden Dice takes about sixty minutes to play and is a dice/tile placement strategy game centered around a gardening theme. Each player takes turns rolling four dice. The dice are used in a variety of combinations to complete actions. You may choose from buying seeds, placing tiles, watering seeds, harvesting plants, flipping special tiles (to gain their abilities), moving critters, or removing critters. Each action costs dice and you can complete as many actions as your dice allow. Once all of your dice have been spent, your turn is finished. Some actions, like watering your seeds and harvesting your vegetables, can set off an action chain, allowing each player to build on each other’s turns. If I choose to water my eggplant seeds (worth five points), any seed tile situated orthogonally beside my eggplant tile that is worth equal to or less than five points will also become watered, regardless of who the tile belongs to. The same happens while harvesting vegetables, allowing each player participating in the chain to score a few points along the way. 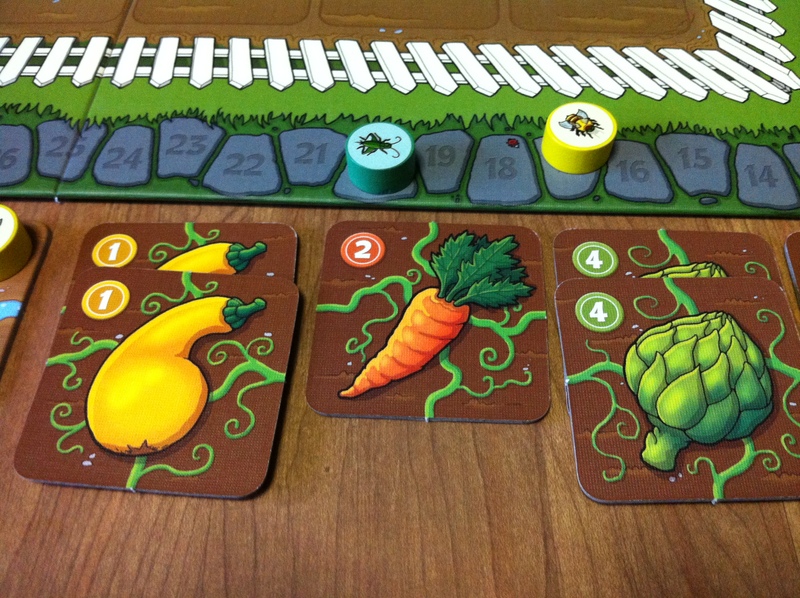 Scoring occurs during your turn as you harvest your vegetables, with bonus points awarded at the end of the game for collecting beneficial combinations of harvested vegetables. The pieces in this game are of high quality, with colorful and whimsical garden themed artwork on the tiles, wooden pieces, and board. You get to play as one of four colors: yellow bees, green grasshoppers, red ladybugs, and blue butterflies. I had a great time looking at the tiny details hidden in plain sight, like the ladybug hanging out on score marker 18. The tiles are graphically connected to each other when they are laid side by side. For example, when the tiles show the seed packet side, there are rivulets of water that flow from one tile to the next. When they are vegetable side up, there are vines that connect the tiles. I found this a helpful detail for figuring out which tiles could potentially become part of either a watering or a harvesting chain. Oh, artwork, you’re so clever! Wayne and I were both playing this game for the first time. The instructions were easy to understand and we only had to refer back to them once or twice to clarify a few things. The most important rules and turn details are on a playing aid which sits in front of you, allowing you to refer back to it when needed. This was a fun game that played well with two people, although I have a feeling that it would play best with three or four. We did not play with the garden gnomes (included in the box), which have their own super special effect on the game, and while we have Garden Dice: The Card Expansion, we decided to wait until after we learned how to play the game before trying it out. While there was strategy involved, there was a prominent luck element. All of your actions are based on how your roll your dice, and if you don’t get the numbers that you need, then you have to decide to do something else.